Two impurities of azilsartan (1·EtOH and 2) have been prepared and the structures have been identified by 1H-NMR, IR and single crystal X-ray diffraction. 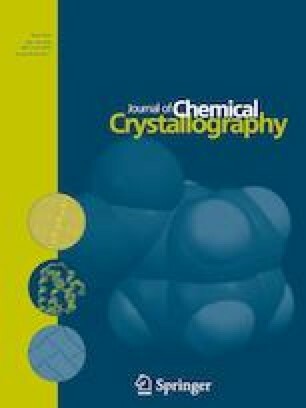 Impurity 1·EtOH (C25H22N4O6, Mr = 474.46) crystallizes in triclinic, space group P-1 with a = 9.0425(15), b = 10.5498(18), c = 12.826(2) Å, α = 76.329(3), β = 79.086(3), γ = 76.763(3)°, V = 1145.4(3) Å3, Z = 2, F(000) = 496, Dc = 1.376 g/cm3, and µ = 0.100 mm− 1. Impurity 2 (C25H20N4O5, Mr = 456.45) is triclinic space group P-1 with a = 9.356(7), b = 9.490(8), c = 13.562(10) Å, α = 72.173(13), β = 73.864(12), γ = 82.628(15)°, V = 1099.9(15) Å3, Z = 2, F(000) = 476, Dc = 1.378 g/cm3, and µ = 0.098 mm−1. 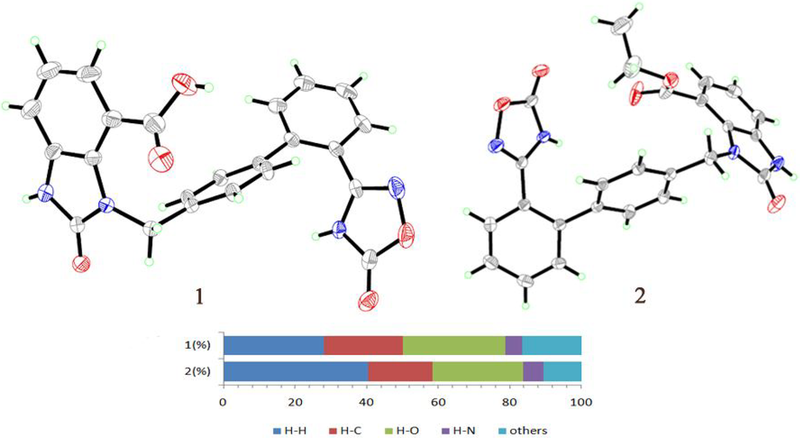 1·EtOH shows a heteronuclear R 2 2 (8) dimeric structure through two N–H···O hydrogen bonds constructed by one 1,2,4-oxadiazol and one 2-oxo-benzimidazole groups, and ethanol molecule is attached by O–H···O hydrogen bond. Impurity 2 shows one-dimensional chain structure through two homonuclear R 2 2 (8) N–H···O hydrogen bonds constructed by two 1,2,4-oxadiazols and by two 2-oxo-benzimidazoles, respectively. Hirshfeld surface analysis shows that the hydrogen bonds are important to stabilize the conformation. Two impurities of azilsartan (1 EtOH and 2) have been prepared and the crystal structures show different molecular configurations and assembly which are predominantly stabilized by the classical hydrogen bonds as well as C–H···N and C–H···O interactions. We thank the Guangdong Provincial Department of Science and Technology (Grant Nos. : 2016A010121004 and 2016B090918075) for financial support of this research.